Enjoy a dedicated place to study or work with the Tribesgns Z-Shaped Desk! The tribesigns computer desk is a wonderful combination of sturdy and beauty,Unique Z-Shaped design not only brings a elegant look also achieve more sturdy structure to make it more stable and beautiful in use. Add this desk to your home office space or den for a perfect work space. Designed for space saving which is a versatile addition to your home decor! 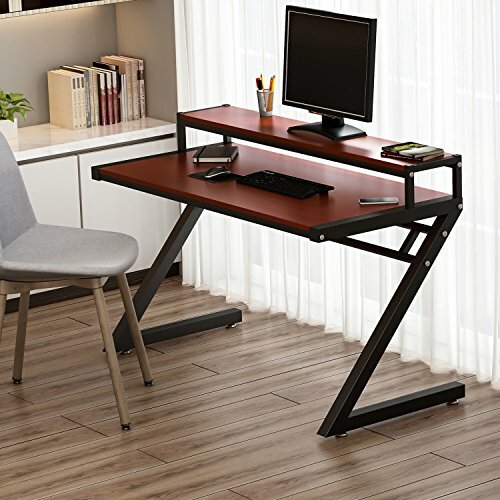 This computer desk with Z-shaped design can help you make efficient use of office space, it's fit anywhere to creat a perfection in your house. This Simple and classic stlye computer desk makes you can find plenty of ways to incorporate this functional piece of furniture into your room. BULID TO LAST: Durability is a key to the construction of the Tribesigns Desk, that's why we reinforced the metal legs, every legs features the dimension of 6*6cm that makes it more stable and durable than other normal desk (the leg dimension is 5*5cm)on the market . SIMPLE STYLE FEATURED WITH VERSATILE USE: This desk has a modern style that enhances your existing decor, it's not only a computer desk, it can be used in study, bedroom even in office to works as a study desk, writing desk or a office desk. Add this desk to your home office space or den for a perfect work space. EASY TO ASSEMBLE: It will took 20 minutes to put together for most people with assembly instruction help. Don't worry about the Installation , it's easy for you!